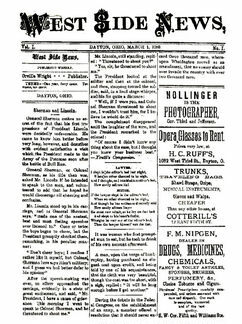 n March of 1889, Orville began to publish a weekly newspaper, The West Side News, betting that west Dayton could support a community newspaper of its own. Wilbur enlisted as the editor of the fledgling newspaper with the second issue. The publication offered little hard news; the content consisted mostly of local advertising, clippings from other publications, and an occasional editorial. The quirky Wright sense of humor also came through from time to time. In the first issue, Orville admonished his readers, "The city election will be held April 1. Vote early and often." Wilbur contributed a tongue-in-cheek weather forecast called The Weather Prophet. According to the Prophet, "For the regions at or in the vicinity of the North Pole, very cold weather..."
The subscription rate was a reasonable 50 cents a year or a penny a week, and there were enough takers to put the business in the black by the second month of publication. The West Side News' modest success continued for more than a year and in April of 1890 Orville and Wilbur decided to make it a daily newspaper. They told their advertisers the new daily would "boom up the business interest of the West Side." They changed the name of the paper to The Evening Item. The Item promised "all the news of the world that most people care to read, and in such a shape the people will have time to read it." 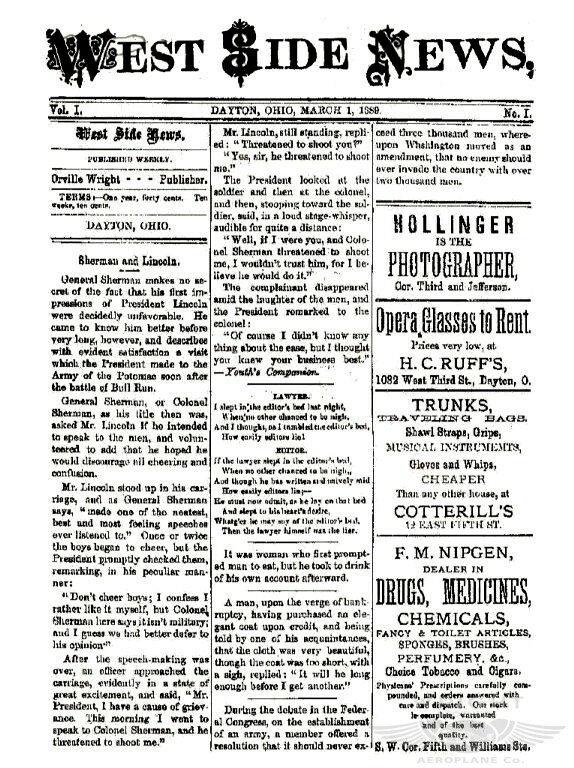 The Wrights subscribed to a wire service for news outside Dayton, and covered local events better than some of the larger, older dailies in town. Wilbur wrote editorials supporting womens suffrage and opposing American expansionism. The brothers also dabbled in yellow journalism, writing shocking headlines to attract readers. "Roasted in Red, Roaring and Terrible Flames," for example, was the story of a fire at a Montreal insane asylum. However, despite sensational headlines and competent reporting, the Item could not compete with established journals. There were twelve daily newspapers in Dayton at the time, two – the Journal and the Herald – with high-speed presses. The Wrights published the last issue just four months after it began. They scaled back the business to job printing, once again hanging out their shingle as Wright & Wright. But they werent quite through with the newspaper business. Late in 1890, they gave it one more fling, more as a favor to a friend than a financial venture. Paul Laurence Dunbar, a high school chum of Orville's, launched a paper for Dayton's African-American community, The Tattler. 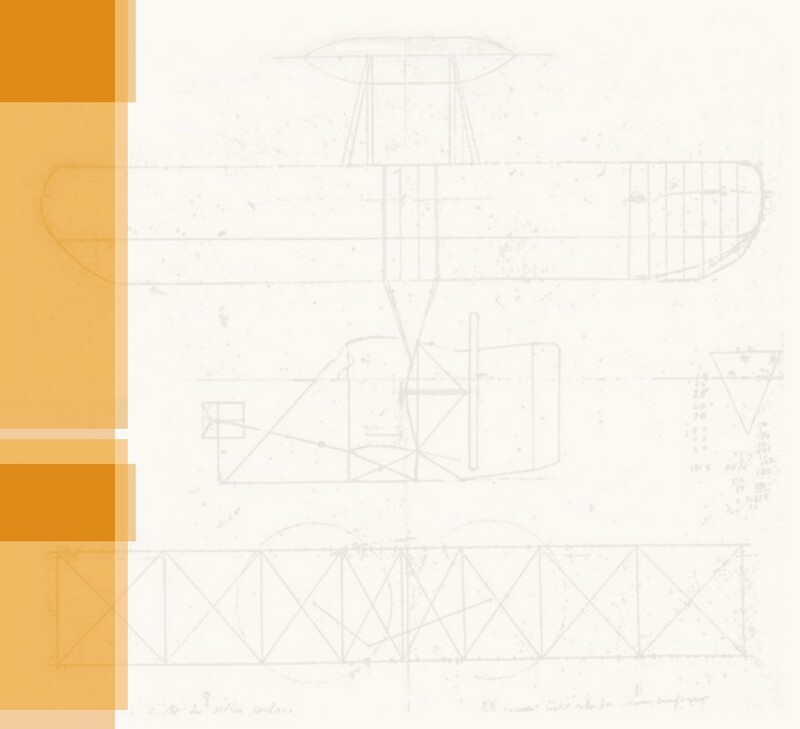 The Wrights published the first issues on credit "as long as our financial resources permitted," Orville recalled. "Which was not very long." The Tattler lasted only three issues. The Wrights returned to printing and Dunbar went on to become a distinguished writer, lecturer, and the poet laureate of African-Americans in the early twentieth century. Volume I, No. 1 -- The very first edition of the West Side News, delivered right to your computer screen. The West Side News weekly kept the West Dayton community informed for a little over a year from 1889 to 1890. The Evening Item, a daily, was less successful. It survived only four months from April to August 1890. The Wright brothers printed three issues of The Tattler in late 1890 for their high school friend Paul Laurence Dunbar. It was their last foray into journalism.